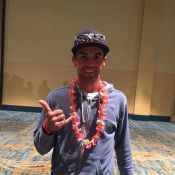 I am an amateur triathlete and coach and I am qualified for the Ironman World Championships in Hawaii! This October 14th I will start for an incredible race ... with you! The Ironman is the longest triathlon: 3.8km of swimming, 180km of biking and 42.195km of running. The Ironman World Championships are held every year in Kona, Hawaii in October, and this year I got the slot from a race in the US. In addition to this competition in Hawaii, I have also just qualified for the Half Ironman World Championships, which will be held in South Africa in September 2018. Supporting me will allow your company to be visible on two major international competitions this year and have their logo printed on my outfits. For the individuals giving me their support, in addition to all my gratitude I will send them a postcard from Hawaii and offer some of them to meet for a Hawaiian party when I return. My only guilty pleasure being chocolate (I’m a real Swiss…) you will support a healthy athlete, with values of perseverance, tenacity, humility and loyalty. This project ended successfully on 29/10/2017 12:00! A postcard from Hawaii, written with gratitude ! I will be delighted to meet you around an Hawaiian beer when I return! For people that will help me, they will receive a surprise gift! --- For companies that wish to support me, their logo will figure on my outfits, to be captured by journalists! People that will help me will receive a postcard, an invitation to an Hawaiian party and a surprise gift! --- Companies that will support me will have their logo figuring prominently on my outfits, big enough to be captured by journalists! My name is Cyril and I am 37 years old. After several years running and doing duathlon, I started long distance triathlon. This year I realized the dream of any triathlete, I qualified for the Ironman World Championships in Hawaii! During those 3.8km of swimming, 180km of biking and 42.195km of running I would like you to be visible by my side!